Definition - What does Horse Pose mean? Horse pose is an intermediate yoga pose that requires flexibility in the hips, as well as a strong core and resilient knees. From mountain pose (tadasana), one foot is placed atop the opposite thigh as in half lotus pose (ardha padmasana). 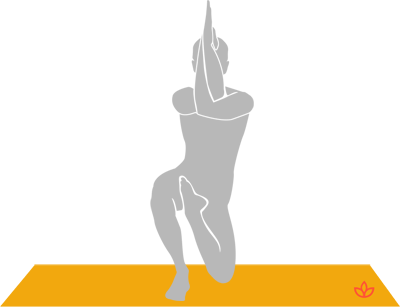 The knee of the standing leg bends, and the other knee is placed on the mat next to the standing foot. The arms raise with the forearms pointing up, and they wrap around each other so the elbows fit together and the palms meet. This is repeated on the opposite side. This pose is sometimes practiced with the hands placed in a simple namaskar mudra (salutation seal) position in front of the chest rather than wrapping the arms around each other. Horse pose is an intermediate pose that should not be practiced by beginners without the assistance of a yoga instructor.